Mohn, poppy in German, began to form as an idea a little over a year ago. It grew from the flower drawings I had been working on at the time when I came across the poetry of Paul Celan. I was immediately attracted to his poems and to his sensitivity towards nature. The natural world around him was integral to his use of language and metaphor. His spare tonal rhythms and compositions resonated with my own intuitive sense of composition. I tried to create prints, not to illustrate the poem, but rather to harmoniously accompany it, its meter and emotion. The prints are evocative of a visual equivalent to rhythm, if there can be such a thing. Paul Celan, a Jew, was born and lived in Romania until World War II displaced his family. His parents died after deportation to camps in Transnistria, Ukraine, his father of typhus, his mother was shot for being 'unfit to work'. Celan spent the war in labor camps in Romania. He wrote poetry his entire life until his death in Paris in 1970. Celan continued to write in German, his mother tongue, trying to reclaim something of his own in a language used for the propaganda of a genocide. While acknowledging his struggles, within himself and with publishing in post-war Europe, he continued to feel that: "there's nothing in the world for which a poet will give up his writing, not even when he is a Jew and the language of his poems is German." By combining these two works, etchings and poem, I hoped to embody some of the aesthetics and meanings found in both, through the book format. The book creates an intimacy by requiring the viewer to handle it as an object, not as art behind glass, and to see it as a greater whole that takes on meaning beyond the composition of its parts. The book is meant to be minimal, and yet I intended many things to be implied, such as the evanescence and fragility of a poppy, a word, a memory, a life, and so I chose the thin Japanese mulberry paper and the silk book cloth. For me, poppies are temporal, yet lasting in their impression on my memory, especially of their color. 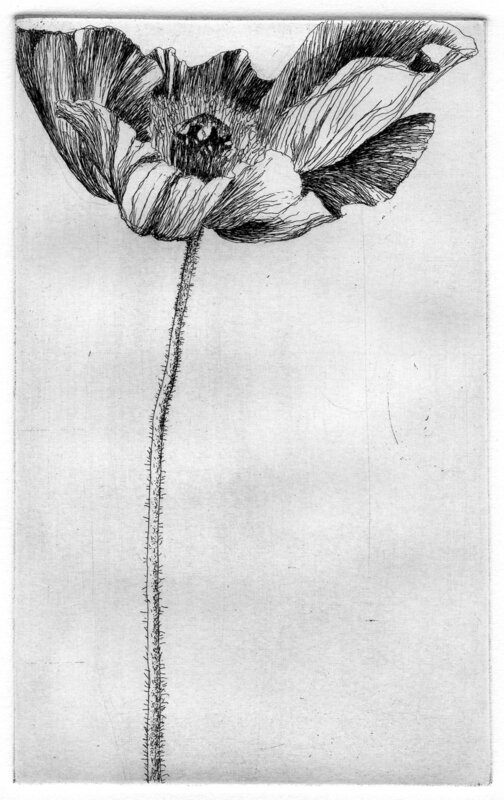 The etchings themselves are without color; the lines are evocative of poppy and of my memory of how a poppy stands. Celan contrasts forgetting and remembering: "we love one another like poppy and memory". What is it that we must both remember and forget? For me, this poem implores that we wake ourselves, that we maintain a greater awareness of injustices, ignored atrocities, and justifications for inhuman acts claimed by those with power rather than moral disgression. Permission to reproduce the poem, "Corona", and translation was granted by Deutsche Verlags Anstalt and John Felstiner respectively. The eight etchings were drawn and handprinted by Sarah Horowitz of Wiesedruck in Portland, Oregon. Mohn was printed from handset Centaur type on Japanese Mulberry paper. The printing and binding were done at Textura Letterpress Printing by Inge Bruggeman with the assistance of Rachel Wiecking. Mohn was designed by Sarah Horowitz. The edition is 20.